47471 Norman Tunna G.C. 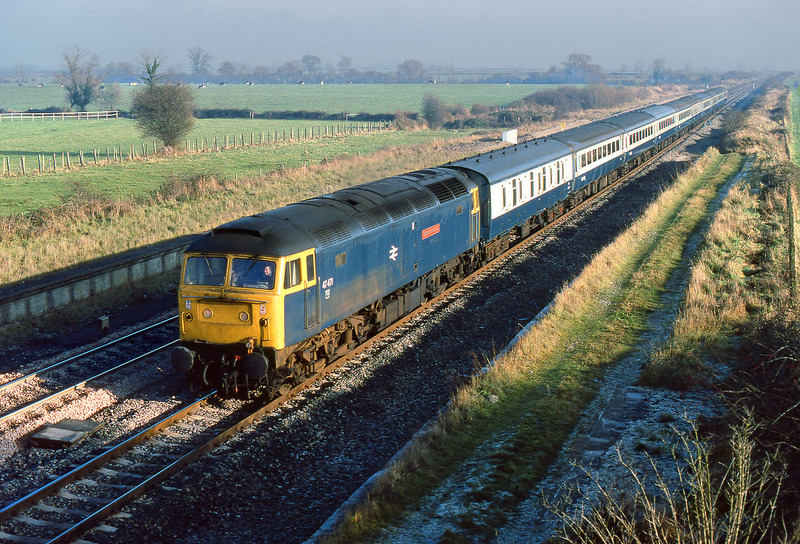 speeds past the grass covered platforms of the long disused Challow station on 3 December 1983 with what is presumably the late running 1C24 10:15 Paddington to Pembroke Dock service. This location is virtually unrecognisable today. A huge signal gantry now makes this viewpoint impossible. Other changes include the removal of the old platforms, the reinstatement of the relief lines, and the open view across the fields in the background being obscured by a row of tall Lombardy Poplar trees. In addition to all this, the view will soon be changed even more the forthcoming Great Western Mainline electrification.